SANTA RITA, Guam – US Coast Guard Sector Guam (USCG) orchestrated a multi-agency Search and Rescue (SAR) Coordination & Execution (SC&E) course for emergency responders at Guam Homeland Security/Office of Civil Defense with the focus of enhancing government agencies’ joint response to SAR, as well as continued international capacity building efforts for Sector Guam’s partners. 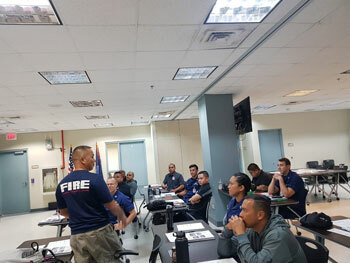 Federal, state, military, and civilian emergency responders from the Federated States of Micronesia (FSM), and Guam participated in the four-day SC&E course that was taught by the Coast Guard National Search and Rescue School out of Yorktown, Virginia. Participating agencies included Federated States of Micronesia (FSM) National Police Maritime Wing, the Commonwealth of the Northern Mariana Islands Department of Public Safety, Guam Fire Rescue, USCGC KISKA, USCGC WASHINGTON, and USCG Sector Guam. The SC&E course introduced participants to various procedures and techniques required to coordinate and execute a maritime search. The lessons covered included: SAR System and Organization, Maritime SAR Assistance Policy, General Salvage Policy, Firefighting Policy, Navigational Assistance policy, introduction to Search Planning, Search Area Development, SARSAT System, Search Planning Variables, SAR Mission Communications, Search Patterns, SAR Operations, On-scene Coordinator Duties, Resource Capabilities, Uncorrelated Distress, and Operational Risk Management, as well as numerous exercises and labs. Traditionally, the SC&E is taught to Coast Guard aircrew and boat crew members. However, due to strong inter-agency SAR coordination on Guam amongst a myriad of agencies, the course is open to any Government of Guam entity that has the potential to respond to maritime SAR. 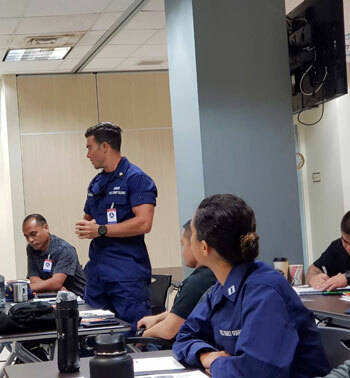 The 2019 SC&E course convening was unique for another reason – Rear Admiral Kevin Lunday, Commander, Coast Guard 14th District and Master Chief Petty Officer Lori Fields, Command Master Chief, made a courtesy visit at the Guam Homeland Security/Office of Civil Defense and discussed the importance of strengthening interagency cooperation as well as partnerships in the South Pacific region. Coast Guard Sector Guam’s Search and Rescue Region (SRR) encompasses nearly 1.9 million square nautical miles of the Western Pacific Ocean, to include Guam, the Commonwealth of the Northern Mariana Islands, Federated States of Micronesia and Republic of Palau.